T0052920999N Weller WXP80 Soldering Set with WDH10 Safety Rest and LTB Soldering Tip Chisel is designed for universal solder joints, features a slim design and short recovery time. T0052920999N Weller also features a WXP80 Weller Soldering Iron with 80W, 24 Volts, a LT soldering application and silver line tip technology. 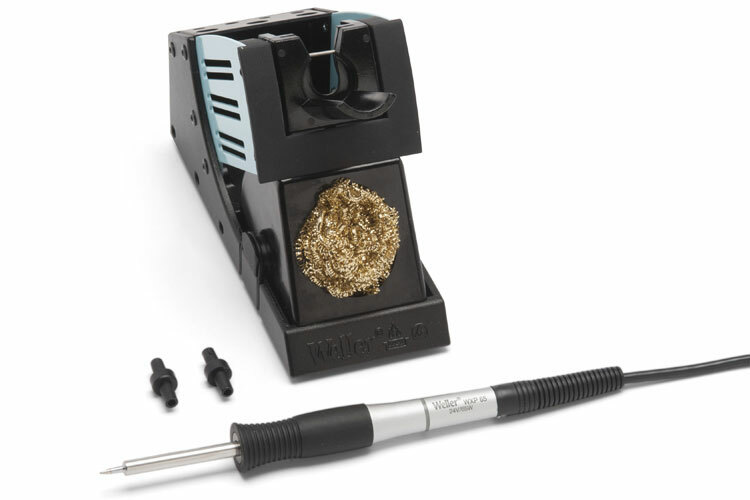 The Weller WDH10 Safety Rest, featured on the T0052920999N Weller Soldering Set, features Stop + Go Function and integrated sensors in the soldering irons that provide for high energy savings. Weller soldering irons and safety reststhe perfect duo for optimum soldering results in the modern manufacturing industry and its diverse requirements. The T0052920999N Weller WXP80 Soldering Set with WDH10 Safety Rest and LTB Soldering Tip Chisel is one of thousands of quality tooling products available from MRO Tools. Please browse Weller Performance Line Soldering Irons for tools similar to the T0052920999N Weller WXP80 Soldering Set with WDH10 Safety Rest and LTB Soldering Tip Chisel. T0052920999N Weller WXP80 Soldering Set with WDH10 Safety Rest and LTB Soldering Tip Chisel description summary: Weller WXP80 Soldering Set with WDH10 Safety Rest and LTB Soldering Tip Chisel. Tip Technology: Silver Line Soldering Application: LT Voltage: 24V Power: 80W WX Compatible: Yes Soldering Tip Chisel: 2.4 x 0.8mm Quantity discounts may be available for the T0052920999N Weller WXP80 Soldering Set with WDH10 Safety Rest and LTB Soldering Tip Chisel. Please contact MRO Tools for details.